COMMENTARY ON "Salvation and the End Times"
This week’s lesson addresses how the Father, Son, and Holy Spirit are involved in salvation. 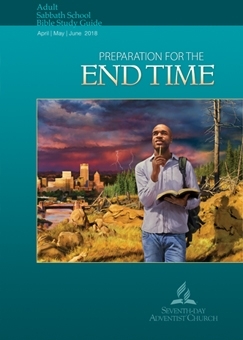 Moreover, this lesson asks the question, “What is the everlasting gospel”, and instead of answering the question, the author uses the Adventist, great controversy worldview to explain what Paul really means in Ephesians 1 where he talks about God’s predestination, adoption, and choice of His people. Although the lesson addresses the love of God, the love of Christ, and the love of the Spirit, the true nature of the Adventist skew of God’s sovereignty and His salvation of man is revealed in Thursday and Friday’s lessons. Because of the way the lesson slides over the words of Scripture and morphs their meanings to fit an Adventist worldview, we will focus primarily on that part of the lesson. Before we address the issue of God’s predestination and choice, however, we must address a paragraph in Monday’s lesson: “Christ became human without any advantage over other humans. He kept God’s law, not through His internal divine power but by relying upon the same external divine power available to any other human” (p. 46). This description of Jesus teaches Adventists that He is a man with inherited propensities (to borrow a word from Ellen White) to sin just like we have. It teaches them that Jesus’ perfect life of obedience and flawless law-keeping is an example to each one of them, that they, too, can keep the law as Jesus did if they just pray and depend on God enough. This description also denies that Jesus, God the Son, could not have failed in His mission nor could He have sinned. Adventism teaches (as I was taught in Adventist school) that if Jesus could not have sinned, He could not have been our Savior. We had to have Someone who “had no advantage” over the rest of us, we were told, because He had to show that the law could be kept. He earned the right to die for our sins because He kept the law perfectly. It was this perfect law-keeping that made it possible for Him to be the perfect sacrifice. If He had been unable to sin, we were taught, He couldn’t have been our Savior, because He wouldn’t have been like us. This explanation strips Jesus of His true identity as revealed in the Bible. Jesus HAD to be the sinless Son of God, 100 percent human and 100 percent God. He did not divest Himself of His “God power” or He would not have been God. God, by definition, possess certain unique attributes including omniscience and omnipotence and omnipresence. If Jesus had not been in possession of those attributes while on earth, He could not have been God. He gave up His glory when He came to earth. He “emptied Himself”, as Paul says in Philippians 2:7, but He emptied Himself not of being God but of His glory and His life in the heavenly realms. He did not empty Himself of being fully God with all His attributes. In fact, according to Colossians 1:17 and 19, it is Jesus’ job to have “all things hold together” in Him. If that is true—and it is—all things held together IN HIM even while He was in Mary’s womb, and even while He was in the tomb. He is ALWAYS fully God. Moreover, Jesus was not sinless because He did not sin; rather, He did not sin because He was sinless. He was born spiritually alive, conceived by the Holy Spirit. He was not born dead in sin, a citizen of the domain of darkness as is every other person on earth. Jesus was the only person ever born who did not have to be born again. We are born literally spiritually dead, “by nature children of wrath” (Ep. 1:1-3). Jesus was born alive from the moment of conception. Jesus absolutely had advantages we don’t have. He was fully God incarnate in a mortal body. In a mystery we cannot explain (because the incarnation is utterly impossible for us to understand), Jesus could not have sinned because He was God. God cannot sin. At the same time, He was tempted as a man, but there was nothing in Him that was attracted to sin, because He was sinless. He was spiritually alive and had never been spiritually dead. He Was God. If He were any less, He could not have been our Savior. A spotless sacrifice is not merely one that manages not to sin. A spotless sacrifice is spiritually alive and never subject to the domain of darkness. He cannot be in any way deserving of the curse of sin. A spotless sacrifice does not become spotless through rigid self-denial. He is spotless because He is born alive. Jesus’ death for our sins, His burial, and His resurrection is the gospel that we need for salvation. It is not less, and it is not more. In order to be saved, we must trust Jesus and His finished work on our behalf. If we do not admit we are hopeless sinners, if we do not repent and admit we need a Savior, we remain in our sins. If we trust Jesus and accept His blood sacrifice as the payment for our sin, our sins are transferred onto Christ. “Just as He chose us in Him before the foundation of the world, that we should be holy and without blame before Him in love, having predestined us to adoption as sons bay Jesus Christ to Himself, according to the good pleasure of His will” (Eph. 1:4,5, NKJV). What more does this tell us about just how ‘everlasting’ the gospel really is? “We were chosen in Him ‘before the foundation of the world.’ Talk about an ‘everlasting’ gospel! Even before the Creation of this world, God’s plan was for us to have salvation in Him. “Look at some of the words here: ‘chose,’ ‘predestined,’ ‘good pleasure,’ ‘adoption.’ Look at how much these two verses point to God’s desire for us to have eternal life ‘in Him.’ And the fact that God did all this in eternity past (see also 2 Thess. 2:13, 2 Tim. 1:9) points so clearly to His grace and shows that our salvation comes not from anything we can do or from any creature merit but totally as an act arising from God’s own loving character. How could salvation come from anything we could do if we were elected to have that salvation in Him even before we existed? The choice is for us to accept or reject it. Significantly, the quote above takes the clear words of Paul that God chooses, predestines, and adopts His own from all eternity and moves the reader into a confusing rationale that ends with our personal choice. Yet Ephesians is absolutely CLEAR that God’s election and choice and adoption are NOT our choices. God sovereignly chooses us. In him we have obtained an inheritance, having been predestined according to the purpose of him who works all things according to the counsel of his will, so that we who were the first to hope in Christ might be to the praise of his glory. In him you also, when you heard the word of truth, the gospel of your salvation, and believed in him, were sealed with the promised Holy Spirit, who is the guarantee of our inheritance until we acquire possession of it, to the praise of his glory (Ephesians 1:3–14). The Bible is unequivocal that God knows His own, having chosen and predestined them for adoption through Jesus. In Jesus, we who have believed have obtained (present perfect tense—we have already obtained) eternal life. In him you also, when you heard the word of truth, the gospel of your salvation, and believed in him, were sealed with the promised Holy Spirit, who is the guarantee of our inheritance until we acquire possession of it, to the praise of his glory (Ephesians 1:13–14). When we hear the gospel (the real, identifiable gospel of Jesus’ death, burial, and resurrection for the payment of sin and the breaking of our curse of death) and believe, God SEALS us with the Holy Spirit. He is God’s promise to new covenant believers, and He comes and lives within us. He Himself is the GUARANTEE of our inheritance, our ultimate glorification. “Salvation cannot reach its ultimate fulfillment in this broken world, limited as it is by sinful human flesh. Therefore, salvation can happen only at the end of time. Although we are sure of salvation, all salvation depends on God, and so only the coming of Christ, at the end of days, will make the reality of salvation possible” (p. 53). This quotation is patently false. We can KNOW we are saved when we believe. We pass from death to life (Jn. 5:24); we are transferred from the domain of darkness into the kingdom of the Beloved Son (Col 1:13). God seals us with His Spirit who is a guarantee of our eternal inheritance. We are still here, saved souls with new hearts and born-again spirits, inside mortal bodies, but the indwelling Holy Spirit guarantees to us that our eternal future is a certainty! He is our Guarantee! When God says in His word that He elects, chooses, and adopts us and guarantees our salvation, He means exactly that. We cannot morph those words into the idea that God has elected all of humanity for adoption. The words mean what the words say. Concurrently, the Bible also commands us to Believe. It further tells believers to teach all things Jesus commanded and to make disciples. The fact that God is sovereign and knows and chooses His own children from all eternity does not negate our responsibility to believe when we hear the gospel. How does this work? We cannot explain it. We only know that because the Bible tells us these things, they are all true. If we could see from an eternal perspective, these two things would not look opposed to each other. We have to live with the mystery of this unexplained reality. God does not explain Himself to us. He reveals what we need to know in order to know Him. Our “job” is to believe, as Jesus said in John 6:29. There is no other “work of God”. And in ways God does not explain, He calls, elects, foreknows, and predestines His own to salvation. We have to believe that both perspectives are true: the God-perspective and the human perspective. Both are true, because God’s word says both are true. Adventism, however, cannot admit that God elects and predestines His own for salvation through Jesus Christ. They must insist that we have free will, and we decide whether or not to “accept or reject” salvation. The analysis of this passage completely ignores Jesus’ actual words, “I never knew you”! It is this not KNOWING that is the cause of their being lost. Knowing Jesus means being born again—a miracle that Adventism cannot explain because Adventism does not believe humans have immaterial spirits that must be brought from death to life. Those who do not KNOW Jesus are the “lawless”. This designation has nothing to do with the Ten Commandments, which is what Adventism insists. Rather, the “lawless” are those who refuse to believe in the Son and remain under the authority of the prince of the air, the spirit now at work in the disobedient (Eph. 1:2). The lawless are those who are not living under the law of Christ. They are not hidden with Him in God (Col 3:3). They are their own authority, and they are still dead in their sin. The lesson makes the second point that these lost ones emphasize their own works and accomplishments. Yet this point is the natural state of ALL mankind when we do not trust Jesus. This summary is false. The way to be saved is clearly stated in Acts 16:31: “Believe in the Lord Jesus, and you will be saved,” as Paul and Silas said to the Philippian jailor. Nowhere, not in any place in Scripture, is keeping the law part of the new covenant! Jesus, the fulfillment of every shadow of the law, has come. He has finished His work of atonement, and He is seated at the Father’s right hand in heaven. Our marching orders are simply to believe when we hear the gospel of our salvation. The law has absolutely no part in our being saved! The saved are those who are made alive by the Spirit when they believe in the Lord Jesus and His finished work. They are the LIVING, not the “good”. Jesus came to bring life to those whom the Father gives Him, and those whom He makes alive have new desires and a new identity. Jesus alone is our salvation, and we who believe were known and chosen by Him from before the foundation of the world! Copyright 2018 BibleStudiesForAdventists.com. All rights reserved. Revised April 23, 2018. This website is published by Life Assurance Ministries, Camp Verde, Arizona, USA, the publisher of Proclamation! Magazine. Contact email: BibleStudiesForAdventists@gmail.com.